When creating new recipes, I tend to stick with what I know. I’ll play around with a pre-existing recipe and watch it morph into something else. Here, my traditional shortbread cookies get a holiday makeover with sparkly sprinkles for a bit of festive bling. Recently, I made a bunch of cookie dough logs for the freezer. Shortbread is one of our favorites and I wanted to put a twist on the original this year. Instead of rolling and cutting the dough into shapes, the shortbread was divided into thirds and rolled into logs. Each log was then rolled in red, white, and green pastel colored sprinkles. After this sparkling appliqué, they were wrapped in parchment paper and frozen. When ready to bake, the trick is to slightly defrost the logs before slicing; they are easier to cut and will maintain a smooth, round shape. If you’ve never made cookie dough logs before, it’s really convenient- just slice and bake! Keep a few logs in the freezer and you will have gorgeous cookies whenever you feel like baking. For us, this was a fun and festive way to enjoy one of our favorite cookies. This recipe requires 3 egg yolks. However, the egg whites can be saved. Place them in a small container (or individually) and freeze- don’t forget to label and date. I’ll post a new recipe on how to use them soon. Stay tuned! When cutting the logs, use a large chef knife. Test the very end piece of the log first to see it it’s ready. If it’s too hard, wait a little bit until it’s easier to slice. Also, it helps to press the back of the knife in towards the log as you cut; this will ensure round and not diagonal sliced cookies. 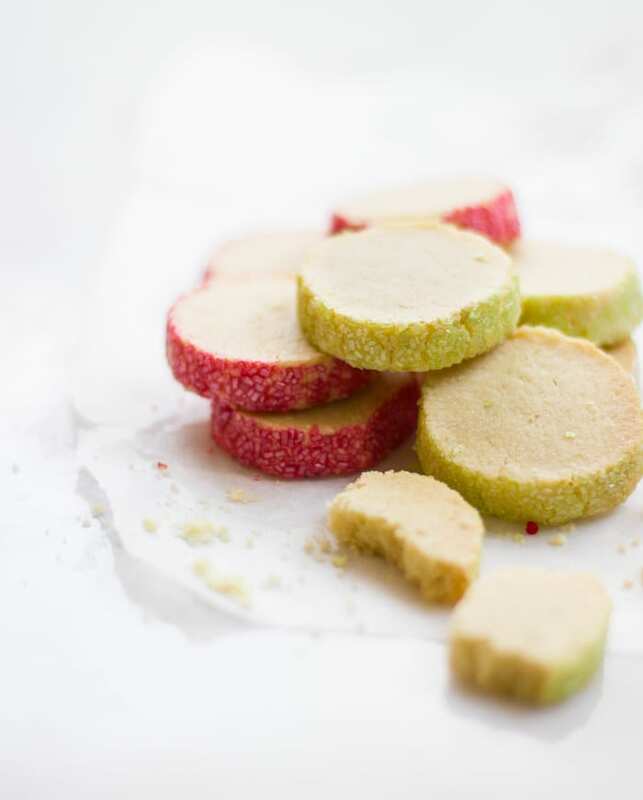 Feel free to add citrus zest or different extracts such as almond or vanilla to vary the flavor of the shortbread dough. I like to use salted butter for these cookies. Although baking with salted butter is a faux pas, try it. The flavor is fantastic. 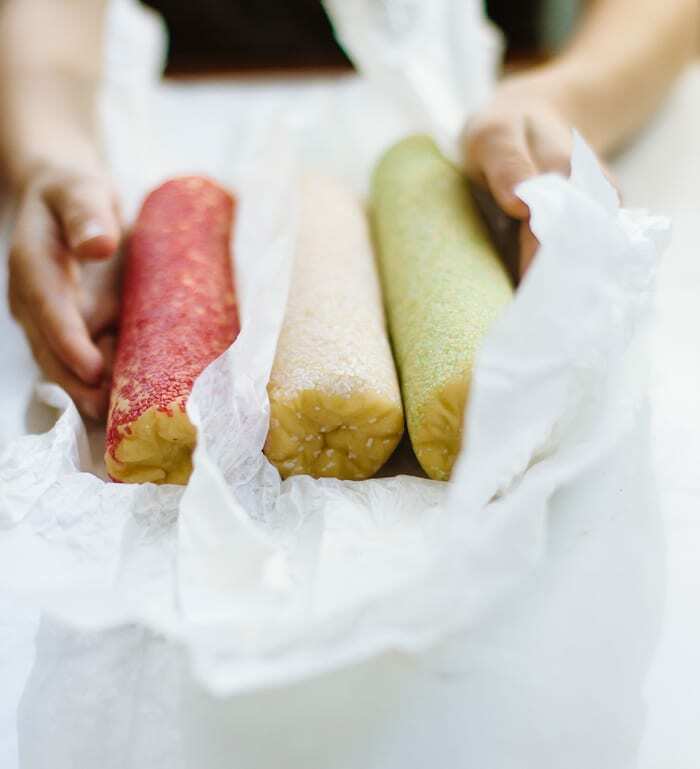 Cookie dough logs can be frozen up to 3 months or longer when wrapped properly. Kitchen Notes: if you want to bake straight away (not from frozen) after making the dough, skip wrapping the logs in parchment and jump to bullet point #7. Bake for about 15-18 minutes. *Save the leftover egg whites. Place them in a container, label and date. Freeze, up to 3 months. **When cutting the logs, use a large chef knife. Test the very end piece of the log first to see it it's ready. If it’s too hard, wait a little bit until it’s easier to slice. Also, it helps to press the back of the knife in towards the log as you cut; this will ensure round and not diagonal sliced cookies. Sift the flour into a large bowl. Add the cubed butter and rub together using your fingertips. The heat from your hands will incorporate the butter into the flour. In another small bowl, whisk the egg yolks and sugar together. Add to the flour. Gently mix the dough with your hands until it comes together into a ball. If it's a bit crumbly, that's normal. Keep working the dough until it comes together. Do not over mix. Divide the dough into thirds. Working directly on the counter, roll each piece of dough into a log about the length of your forearm. Roll each log into the colored sprinkles, respectively. Wrap the logs snuggly in parchment paper and twist the ends to close. Label and date. Freeze until ready to use. To bake, preheat your oven to 325 F. Line 2 rimmed baking sheets with parchment paper. Defrost the logs for a couple of minutes or so. They will be easier to slice and will maintain a smooth, round shape. Using a large chef's knife, cut the frozen dough logs into rounds, about ¼- inch thick (refer to a tape measure). Transfer to the prepared baking sheets. Bake for about 25-30 minutes or until very lightly golden (adjust baking time if you find that your cookies need a little bit longer in the oven). Swap and rotate racks for even coloration. Remove the cookies and cool for about 5 minutes on the tray. These are beautiful. I love using colored and flavored sugar to coat slice and bake cookies. I’d be hard pressed to pick just one favorite holiday cookie, but I’ll go for Spritz cookies. We break out the cookie press just once a year – at Christmas, so I’ll go with that. I send warm wishes to you and yours for a terrific holiday season! These cookies are so cute!! and logs are a fantastic idea, although I need to do it more to save me some energy and time :). I agree with you about the salted butter ! Its funny you are the first person I have come across to use salted butter! My family including grandma makes these shortbread cookies with salted butter and they turn out fabulous! I’ve always baked with salted butter, so much more flavour to baked goods. By the way Emilie, love your blog, I am a new follower. Looking forward to ordering your cookbook. Thanks for all the great recipes and helpful hints. I am also a fan of slice and bake cookies as I work full time. Anxiously awaiting your next email. Yes it’s always good to stick with what you know and you can never go wrong with shortbread cookies! These look like a great way to snack on some cookies this Christmas! I’m a sucker for shortbread all the way. My kids too. Thank you Linda! I love your recipies (the fish for Thanksgiving for ex). I can convert lb to kg and Farenheit to Celsius, but how much is 2 “sticks of salted butter” (the shortbread)???? Hi Catharina! Excellent question. 2 sticks of salted butter equals approximately 226 grams. I love this idea, to roll the shortbreads in sprinkles. It looks so festive and I bet it tastes happy. Happy cookies- I love that! The additional of sprinkles is such a nice (and easy) way to spruce up something tried and true. You can do it with any recipe, really. Happy festive season to you! 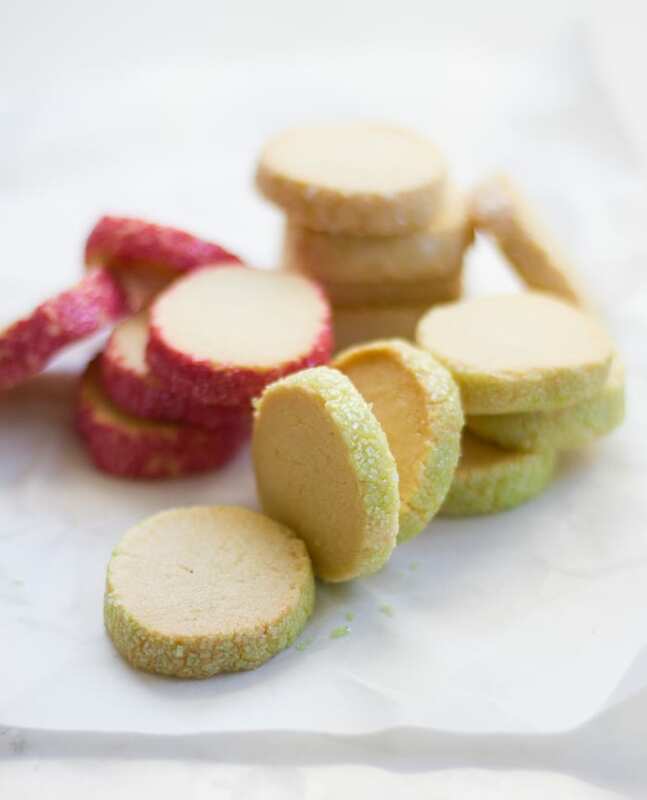 These shortbread are beyond pretty, I adore the pastel sprinkles! What a fabulous idea Emilie. Those shortbread cookies looks so festive. I need to use this tip and make later. I love a similar cookie which is popular in India which uses chickpea flour, nuts and dried fruits, so good and freakin so addictive. So I hardly make them. I love shortbread cookies!!! love the holiday makeover with the festive bling! Oh Emilie.. I am adding these to my Christmas gift baskets. Can’t wait what you’ll create with the leftover egg whites. Shortbread is the perfect cookie and these look fab! And what a great idea to have it ready to go in the freezer – slice and bake cookies anytime! Hi, thanks for the recipe! I just made these and placed them in the freezer. When I am ready to slice and bake, what type of knife or tool do you recommend for slicing, non-serrated knife, string, etc? Thanks again! Hello Diana! Excellent question. I would use a sharp chef’s knife (mine is 8″). Make sure to defrost the logs slightly before baking- I always test the very end piece of the log first. If it’s too hard, I wait a little bit more until it’s easier to slice. Also, when cutting, it helps to press the back of the knife in towards the log; this will ensure round and not diagonal sliced cookies. Is the Florida Crystals the white or brown ….? and can you sub regular cane sugar ? The Florida Crystals are white, or ‘blonde’ I should say. I use this brand because their sugar is less refined. But yes- you can sub regular cane sugar for this recipe!